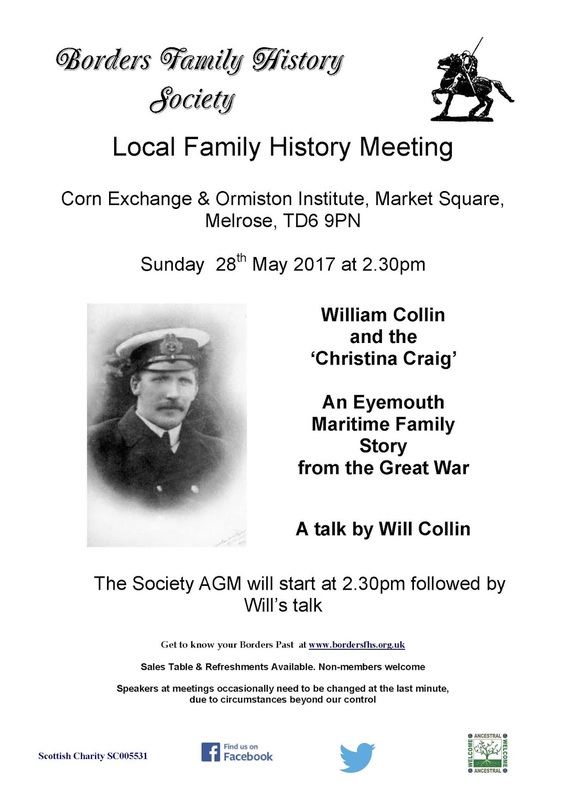 The last meeting of our 2016-17 season is on Sunday 28th May at the Corn Exchange, Melrose, 2.30pm when the talk will be preceded by the Society AGM. Please come along to find out what we have been doing and also about our plans. 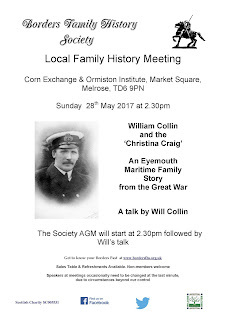 Will Collin will present an illustrated talk on "William Collin and the ‘Christina Craig’ - An Eyemouth Maritime Family Story from the Great War". 2018 marks the 100th anniversary of the loss of the Christina Craig, one of many Eyemouth fishing boats and crews which were signed up by the Admiralty to serve in the World War I Auxiliary patrol. Many photographs remain in the Collin family and are included in the talk.